Most of the funky rain boots you find will be designed with women and kids in mind. They tend to feature wild colors or patterns and sometimes even use unexpected materials as accents. 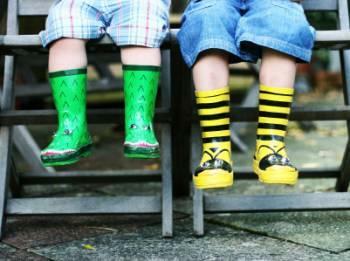 You may find yourself wanting to wear your funky boots when it's not even raining! Rain boots are the ultimate excuse to really wear your personality on your feet. Rain boots are supposed to be bright and fun, right? You can wear them with anything, but for the best overall effect, try to choose rain boots in the same color family as the rest of your outfit. For example, if you're wearing a brown skirt and a green sweater with brown tights, consider the brown Chookas with green hearts and detail. Funky Wellington Boots: If you're in the United Kingdom, you may fall in love with this site, which brings you the funkiest styles from Wellington. Find women's styles like Blue Paisley, Cool Pink, Poppies, and more. The bright colors are sure to bring a smile to your face even when the weather is at its gloomiest. Be sure to check out their clearance section for a less expensive collection that might bring an even bigger smile to your face. Amazon: Here, the stock is always changing, so that means you can keep checking back for more inspiration. Nordstrom: You'll find a large selection of funky rain boots here, including Chooka styles. Expect to pay between $60 and $80 for most women's sizes and around $32 for kids' sizes. Chooka Boots: Here, you can easily (or not so easily!) decide between the different styles of Chooka boots. They're split into four rain boot categories that include standard rain boots, riding boots, rain pups, and front lace rain boots. Styles range from edgy (the Tattoo City and Dueling Skulls styles, for example) to completely girly styles like Pink Pingos, Foil Flower Fur Top (with a faux fur top), and Cheetah Dual Buckle. You will also see any special collections they may have, such as Hello Kitty and Tokidoki. These boots tend to come with a cotton lining that will wick away moisture from your feet. You may not find them quite as warm as those lined in micro-fleece, but if you're not in a very cold climate or you're experiencing summer showers, these may be just what you want. You can find Western Chief boots at Nordstrom or REI. The funky styles are available for women and kids. Choose from styles like red ladybugs and green alligators. Some of them even have faces on the toes of the boots. When shopping for rain boots, what they look like is important and intensely fun, but don't forget what you want your rainboots to do for you aside from get approving nods from strangers. Look for rubber boots with soles that claim to provide excellent traction and a lining for extra warmth if you need it.